Fern ally with long creeping rhizomes & erect aerial stems. Sterile leaves narrowly triangular, fertile leaves in erect cone-like spikes. Common and widespread in lowland Tasmania in well-drained sites in heathland or dry sclerophyll forest. Also colonises roadsides where it grows with its rhizomes exposed. 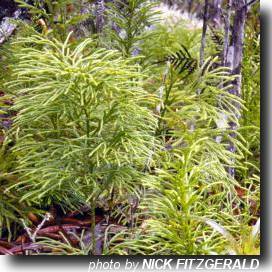 An attractive and distinct species with large upright stems resembling a small conifer. Suitable below powerlines. This species has not yet been successfully cultivated with collected plants dying quickly.